If you are looking for a side-by-side overview of the crucial qualities of ButcherBox and Meat The Butchers, we have just what you need. Our ButcherBox VS Meat The Butchers comparison allows you to find out everything about their offers and see which one is superior to the other when it comes to meat quality, variety, and more. We have brought all the major facts to one place and provided objective ratings for both services so you can make your decision more easily than you expected. Meat The Butchers is a reliable supplier of fresh and natural beef, pork, lamb, and poultry. It only offers the highest-grade meats, its rich offer includes sushi-grade seafood, and its ordering system is perfectly flexible. ButcherBox offers monthly deliveries of pasture-raised, grass-fed beef and high-quality, natural pork and chicken. Opt for a subscription and handpick the items in your box or let the experts do the choosing. Enjoy tasty meat gifts and free shipping with all orders. Meat The Butchers offers over 70 different cuts at all times, including USDA Prime, Wagyu beef, and beef that is naturally dry-aged for 28 days, as well as all-natural chicken, quail, turkey, pork, and lamb. Meat The Butchers exclusively offers Upper Choice and Prime grade meats, thus ensuring that the meat that reaches your home is always of premium quality. In addition to premium meats, Meat The Butchers provides fresh seafood and pantry items like glazes and marinades. Meat The Butchers sources meat from family-owned farms and ranches that employ humane raising practices and adhere to high standards of sustainability. Its poultry is free-range and its red meat is corn-fed and grass-fed, never grain-fed. Meat The Butchers allows you to shop commitment-free, with no minimum order. Its flexible meat subscriptions are currently unavailable. If you have an issue with your order, you can reach out to Meat The Butchers customer service via email or phone. Refunds are not guaranteed. Meat The Butchers offers free shipping on larger orders. The free shipping threshold ranges from $75 to $350 and depends on location. Meat The Butchers ships throughout the continental US. 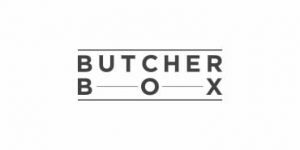 ButcherBox offers more than 60 different cuts of beef, pork, and chicken, available in curated and custom boxes. You can purchase delicious cuts like New York strip steak, ribeye, sirloin steaks, roasts, chops or ribs and various interesting add-ons such as breakfast sausage, burgers, and uncured, sugar-free bacon. ButcherBox offers premium-quality meat. Its beef is grass-fed and grass-finished, it only sells heritage pork, and its chicken is free-range and organic. The meat you receive from ButcherBox is grown on family-owned farms that employ humane cattle-raising practices. The animals interact with one another in the pastures, they have safe, uncrowded shelters, and the farmers do not interfere with their natural diet. ButcherBox offers flexible subscriptions that you can modify, pause or cancel at any time. Keep in mind that you should make the desired changes before your order is billed. If something is wrong with your shipment, reach out to ButcherBox immediately and you can get a replacement or a refund. ButcherBox offers free shipping on all orders. ButcherBox ships throughout the contiguous US. Real meat, fresh, perfectly marbled. If you know your meat, you can taste the difference right away, this is the real stuff, not the crap they sell at the stores. My warmest recommendation. These people have the worst customer service. I have had several issues with boxes being shipped with no chance to bump the order. One customer service rep told me it is not their policy to send reminder emails, even though I have received one before most orders. Then a manager tells me that, yes, they do. I didn't receive the email for the latest box until 3:00 this morning and then another enail at 10:30 that it shipped. No chance to bump it. And salmon was added to it, that I did not authorize. Now I have to pay for $200+ pounds of meat that I would have bumped had I received the warning email. The manager did not even try to make it right. She threatened to hang up on me as she said the call was no longer productive when I tried to argue with her. She didn't even offer a discount or anything. I will be canceling my account and taking this up with my credit card company and the BBB. Wasn’t sure it was worth the cash, because I usually pay much less for decent quality meat. My wife really wanted to order, because her best friend said they were the best and I’m not sorry we decided to subscribe in the end. Much better than what we usually get, got the mixed box, just enough for the 2 of us, really satisfied with the first shipment, we’ll see if they keep up the good work. First of all, great meat and it arrived in perfect shape. I let them choose what goes into the box and I was pleasantly surprised to see that they were mostly premium cuts. I didn’t give them 5 stars because it really doesn’t make sense to allow for such huge variations in quantity, like someone already pointed out. It’s not really cheap, so it would be more fair if they said exactly how much meat you get, so you can figure out if the prices is ok or not. ButcherBox is one of the easiest ways to enjoy the highest-quality, grass-fed beef, organic chicken, and heritage breed pork. The service offers an impressive range of antibiotic-free, hormone-free premium and convenience cuts and allows you to decide on both the quantity and selection of meat in your box. Read more about it in our ButcherBox review.